On January 20th, 2018 officers were dispatched to a business in the area of 7500 E 61st St in reference to a burglary from vehicle report. Officers learned that an unknown individual was witnessed exiting the victim’s vehicle with a package. The victim attempted to stop the individual but he left the area in a small red vehicle. 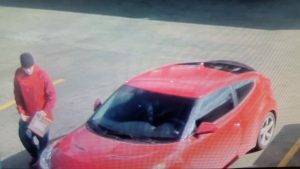 Detectives were able to obtain video surveillance from an area business that showed the two individuals involved and the vehicle they were seen leaving the area in. 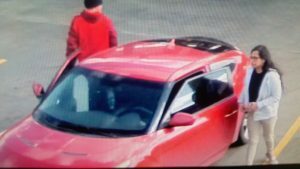 The vehicle used is described as a small, red, two door Hyundai with a hatchback. 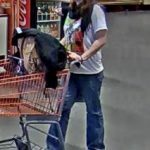 One individual is described as a white male, 30’s, wearing a red hooded sweatshirt, black stocking cap and blue jeans. The second individual is described as an unknown race female, thin build, around 5’2”- 5’5”, 30’s, wearing glasses. She was last seen wearing a navy shirt, light colored jacket, and tan pants.